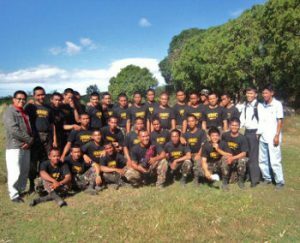 We conduct two crusades for the scout rangers of Camp Tecson each year and our first crusade for 2011 resulted in the baptism of 41 scout rangers and 13 civilians (15 rangers on April 23 and 26 on May 2). We now have a big number of baptized rangers but the problem is that the Adventist Church is very far from Camp Tecson. The baptized scout rangers are not allowed to go to that church because of the far distance for fear that they might encounter an ambush along the way. Only 10 scout rangers are allowed to go to church. Therefore, Sgt. Emelio Ke-e, one of the active new members and I thought of a solution. Why not build a church for the scout rangers here in Camp Tecson? But the problem is, we do not have funds. 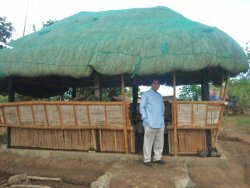 We have a small thatch roof hut but the seating capacity is for 30 people only. It is located outside the camp and serves as a place for morning and evening worship. It cannot seat 200 people. We are praying that God will help us build a church for the Camp Tecson Seventh Day Adventist Company. We have many baptized scout rangers now who wish to be able to worship in a church every Sabbath. If you wish to help us, please let Ma’am Reva Moore know at (revawall@bellsouth.net) Or you may DONATE through the AMI website: http://www.a-a-m.org. Please INDICATE: For Church project of Scout Rangers. Thanks so much!